Turn off circuit breaker for the water heater. Attach the hot temperature sensor to the T&P Valve. Attach the cold temperature sensor to the cold water pipe. Turn circuit breaker back on. Pair Aquanta with WiFi and complete online setup. You now have a smart water heater! 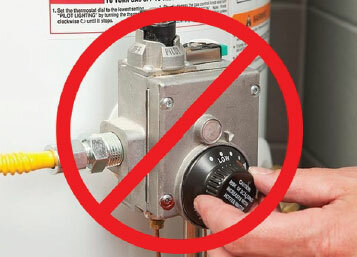 Unplug the water heater if it is a power-vented model. Connect the communications cable and plug in the Aquanta controller and water heater. Can I – Should I – Self-Install? The Aquanta version for electric water heaters can be installed by a “handy DIYer,” meaning that if you are comfortable replacing a light fixture, putting in Aquanta should be a snap. No specialized electrical knowledge, certification, or equipment is needed. The version for gas water heaters is even easier, with no electrical or other hookups required. With some preparation, either Aquanta version should take no more than 15 minutes to install. Purchasers are responsible for ensuring that Aquanta and its installation are compliant with all relevant local codes and regulation. If you are planning to self-install your Aquanta, please review the relevant Installation video to make sure you are comfortable with the process before proceeding. Will Aquanta Work in My Home? Aquanta is designed for use in tank storage-style water heaters – like those found everywhere in the US, Canada and in many parts of the world. It is designed for tanks holding 120 gallons and less, and will not work with heat pump, boiler-fed or tankless (also called “on-demand”) water heaters or “combi” systems. 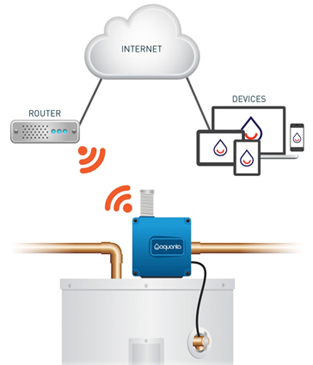 Important: Aquanta can control electric water heaters as well as those gas water heaters with electronic gas control valve (which represent the majority of the gas water heater installed base). If your gas tank has an old-style, mechanical control valve (like left picture), Aquanta will be able to measure the energy and provide most of its reporting features, but cannot control the heating element. Aquanta is controlled via Wi-Fi, so you need a home Wi-Fi router for it to connect to its cloud-based control system and user interface. While you don’t need to have a home networking hub for Aquanta to work, we plan to integrate into all of the major platforms.